« Proof that Elementary Students Have FUN with Shakespeare! Educators often face the difficult task of engaging students who are increasingly distracted by the fast-paced technology driven society in which we live. Although Elizabethan times moved at a slower pace, Shakespeare faced the same daunting challenge as teachers today, keeping the attention of such a diverse population. While Shakespeare’s audience differed more in terms of social classes than ethnic diversity, he still had to write plays that would reach audiences on all levels. As an elementary ESOL (English for Speakers of Other Languages) educator, when I began to consider using Shakespeare in the classroom, I was looking for a meaningful way for my students to experience language. What began as an experiment to give my students a taste of the Bard became the cornerstone of my students’ language instruction. While some teachers feel that Shakespeare should be saved for high school English class or reserved for only gifted students, I felt that my ESOL students should not be denied the many benefits that early positive experiences with Shakespeare can bring. Holly's Students perform a scene from Richard III in the 2010 Emily Jordan Children's Festival at the Folger. As a result of incorporating Shakespeare’s works into my curriculum, my students became more confident, increased their English proficiency skills and felt distinguished among their peers. Often second-language learners feel behind their native English speaking peers and struggle to close the achievement gap. By experiencing Shakespeare at such an early age, English Language Learners (ELLs) are able to prepare in advance for more in-depth study of the plays and sonnets, thus facilitating the closing of that gap. 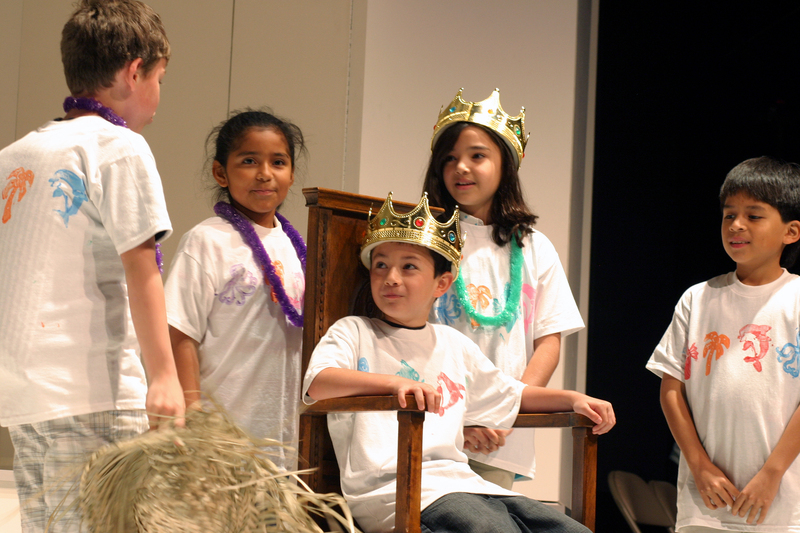 Elementary Shakespeare education can serve as both intervention and enrichment language instruction since it provides both support and challenge for all students. Because Shakespeare wrote for everyone, his works are ideal for students of all ages, language backgrounds, and economic levels. How can you bring Shakespeare into your classroom? Holly Rodgers is an elementary school ESOL (English for Speakers of Other Languages) teacher in Fairfax County, Virginia. She will be a presenter at this year’s Folger Elementary Educators Conference and has created ELL (English Language Learner) and elementary focused lesson plans for the Folger Education Website. In 2010, her students performed at the Emily Jordan Folger Children’s Shakespeare Festival and were also featured on the Verizon cable program Push Pause. She has spent her varied educational career as both a language and music teacher. She earned her M Ed in Multilingual/Multicultural Education from George Mason University and her BME in Instrumental Music from Louisiana State University.